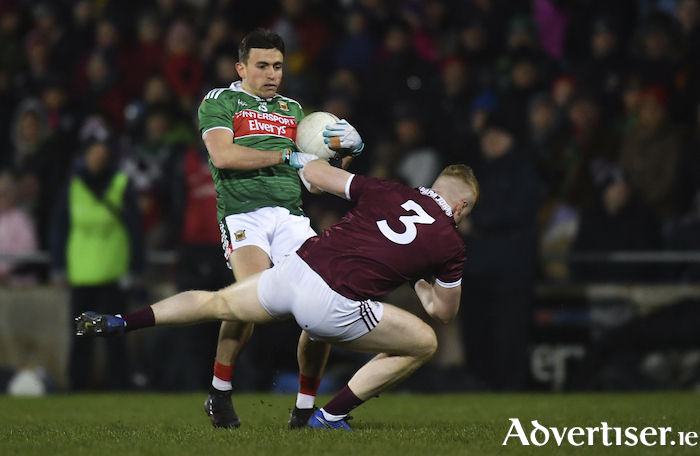 Mayo once again failed to get the better of their near neighbours, as Galway edged home deserved two point winners in MacHale Park on Saturday night. It looked like the game was there for the taking for Mayo with 15 minutes to go when Andy Moran pointed a mark from close range after being picked out by Aidan O’Shea. That score put just one point between the sides and Mayo had all the momentum with them. Jason Doherty had a chance to level it up with a free two minutes later, but his effort came back of the post and Galway cleared the decks and from then on retook control of the game with Shane Walsh tagging on three pointed frees after sloppy fouls by Mayo close to their own goal. Diarmuid O’Connor’s point deep in injury time gave Mayo the chance to go and steal a point from the game - they gathered the restart but Donal Vaughan could only drive the ball high and over the bar when Mayo needed a goal to save the contest. Galway started the game with the aid of the howling gale that blew into the Bacon Factory end of the ground and put it to good use going in leading 1-7 to 0-3 at the turn around. Mayo even got the advantage of playing with two extra men in a ten minute period of the first half, but were outscored by Galway by 1-1 to 0-1 in that period. The Tribesmen goal was a well executed and worked move with Antaine Ó’Laoi picking out Johnny Heaney with an incisive pass, the Galway number seven drew David Clarke and fed the ball across to the inrushing Danny Cummins who palmed the ball to the back of the net from close range - to put his side into a 1-6 to 0-3 lead. All Mayo’s scores at that stage coming from placed balls by Jason Doherty, with Galway landing points from Cummins twice, Ó’Laoi, Michael Daly, Shane Walsh and Heaney. Ó’Laoi would go on to kick another point before the break to send Galway in six up at the short whistle. Just as he did the week before against Dublin Matthew Ruane kicked Mayo’s first point of the second half and that was replied to by a Walsh free. But from then Mayo upped the gears and wrestled control of the contest back in their favour. Doherty slipped over two frees and Darren Coen hammered over one from well out the park to bring it back to a four point game, then Doherty put two more placed balls between the posts and Andy Moran chipped in with a close range pointed mark to make it 0-10 to 1-8 and all looking good for Mayo. But they were unable to keep their momentum going and a three late Walsh frees saw Galway home with O’Connor and Vaughan’s injury time points not enough on the scoreboard at the end of the evening. Dublin: R Lavelle; E Kerin, SA O’Ceallaigh, D Wynne; G O’Donnell, G Bradshaw, J Heaney; T Flynn, C Duggan; M Daly, J Duane, E Brannigan; B McHugh, P Cunningham, A O’Laoi. Subs: F O’Laoi, G Bradshaw, E Brannigan, P Cunningham.